Change has become a constant and it won’t go away. If companies want to be and/or stay globally competitive, they have no other choice but to go through operational improvements. I meet so many managers, supervisors, team leaders and workers who are frustrated, resistant and fearful when it comes to change. They have absolutely no idea how to cope with all the changes that come their way. People have to learn to be comfortable while being uncomfortable. The goal can change, the teams change, the playing field, team roles, materials, strategy, time constraints, the level of challenge, processes, systems, expectations, management, customers, suppliers, and the list goes on and on. Would you like to learn how to guide your team during times of change? Provide Information: When people learn about any kind of change (personal or professional), they first go through shock and denial. In this stage they have to understand “why” change is happening. Allow them to process their emotions by expressing their fears, frustrations and concerns. Helping them to explore the benefits will definitely help. 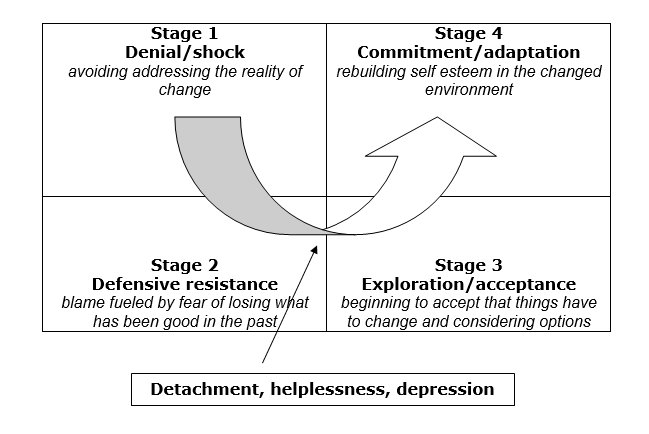 Provide Support: People often get stuck in stage 2 (frustration, depression, resistance) because they don’t get full management support. They have to have the tools in order to succeed. Unfortunately top management is often disconnected from the plant level. Saying things such as “make it happen” or “don’t ask, just get it done”, doesn’t allow them to get to the next level. It is unfortunate but this may evolve into a “Groundhog Day” experience. Provide Direction: Where are we going? What’s the vision? How can we work together to make sustainable improvements? It is important to make the distinction between acceptance and commitment. Management often let it go too early, being certain of successful adaption. If people accept change, it doesn’t mean that they are at the commitment stage YET. Provide Encouragement: If people admit it or not, everyone needs encouragement to see things through. Pay close attention to effort and progress, and make sure to celebrate small wins along the way. This is key to make change part of your new normal. Leaders today have to get a good understanding of what people go through emotionally in order to make change sustainable. It is a skill that can be learned. Be mindful and you and your team will thrive on change. I believe in happy endings. Do you?